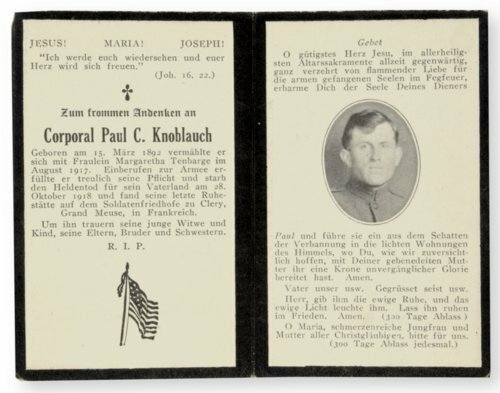 World War I-era memorial card in the German language, honoring the life of Corporal Paul C. Knoblauch of rural Reno County, Kansas. Paper mourning card with central fold and images of Jesus, the U.S. flag, and Knoblauch. The subject lived in a German-speaking farming community west of Wichita. He enlisted in the armed forces when the U.S. entered World War I in late 1917, and went to Europe with the 7th Infantry Regiment of the Army's Third Division. The Third participated in three major operations, including the Marne and the Meuse-Argonne. Knoblauch died on a battlefield northwest of Verdun in October 1918.